The festival in Buraidah attracts traders and the public to the world’s largest date collection during harvest season, gathered from more than 6 million palm trees in the region. Saudi Arabia has the highest number of palm trees in the world with more than 23 million, accounting for 20 percent of the world’s production. There are more than 6 million date palms in Qassim province alone. “The youth have been inspired to open small projects concerned with date trade,” said Al-Naqeedan. According to official statistics, the number of visitors has yet to reach this year’s expectations, seeing as the date season is only half over. Al-Naqeedan said that there was still plenty of time left in the season, and date prices were low despite it being peak season. “Al-Sukari, being the most priced and popular date, dominates the market, while Al-Kalas, which stands at second place, is expected to enter the market by this week,” he said. Currently this season, the prices of dates have fluctuated since the beginning of the harvest season, and disparity of prices are the main feature in date business this year. Abdulaziz Al-Tuwaijiri, member of the National Center for Dates, said that there was a good trend in the market, especially for traders this year. There was still a long season ahead to store enough for the coming month of Ramadan. A number of internal and external shows have been organized for the marketing of dates, and prices will gradually increase after the season. He expected that by next year the price of dates would increase more than 40 percent compared to the last few years, and prices were expected to rise more than 100 percent ahead of Ramadan, especially for Sukari, Kalas and some other items favored by Saudis. Al-Tuwaijri added that some of the traders worry about financial losses in storing large quantities of dates, especially since storage costs had risen more than 20 percent this year. Abdullah Al-Dahyan, Director Board Chairman of the Agricultural Cooperative Society, said that storage, refrigeration and cooling would keep the dates in good condition this year after having waited out such a long date season. He added that the long season helped farmers to develop farm products. “But marketing is still a great weakness for farmers. Now they have been achieving good returns as outlets are selling their products without artificial additives on the most prominent products in Saudi Arabia,” said Al-Dahyan. He added that the date was the first food in Saudi Arabia after wheat decline in quantity. 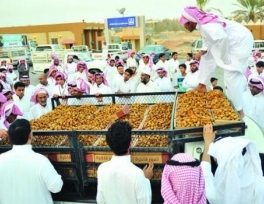 “We have reached the amount of 1.2 million tons of dates in Saudi Arabia, while wheat production has reached up to 4 million tons in previous years, which outweigh the needs of the Kingdom more than 50 percent,” Al-Dahyan said.